I think this is a classic recipe here in the northern Italy. The sausages matches perfectly the taste of mushrooms and create a perfectly balanced taste (and smell). For this recipe I used a whole Vialone Nano rice. 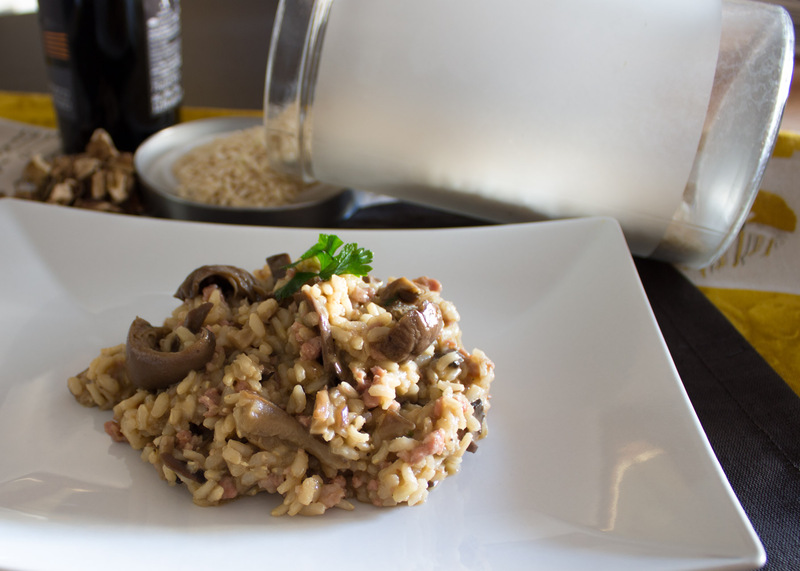 It’s a typical product of my region and, while a little longer and more difficult to cook, it really makes the risotto much better than the carnaroli, at least to my personal taste. I like whole rice more than the normal one because the taste is stronger, but you can totally use the carnaroli if you find it better for your taste. 1 cup of carnaroli rice. 1 small minced scallot or onion. 1 tbsp of unsalted butter. Half glass of white wine. Place the mushrooms with 3 cups of hot (but not boiling water) in a bowl and let them rehydrate for half an hour. They should at least double in volume. Once rehydrated, drain them and filter the dark, brown water with a strainer and a blotting paper, salt, and boil it. We’ll use that water to cook the mushroom and the rice. Add a tablespoon of olive oil in a pan with a smashed clove of garlic and let it warm up at low temperature. Add the mushrooms and cook them for 15 minutes at medium heat, with a pinch of salt and the parcley (1). The mushrooms should release some water that will evaporate, and cook in the meanwhile. If they dry too much, add a little boiling water from the mushroom we prepared earlier. Once cooked turn the heat off, remove the clove of garlic, and place aside in a dish. In the same pot you cooked the mushrooms, add another tablespoon of olive oil, warm it up, and add the minced scallot. Let it sauté for one or two minutes, then add half a ladle of water from the mushroom, then cook at low heat for 3-4 minutes until most of the water evaporates. This process will make the scallot softer. Then add the minced raw sausage filling, and roast it until it creates a sort of thin “ragu” (2). Once browned, put the sausages along with all their fat in a plate, and again, in the same pot, add the rice. Toast it at medium high temperature for two minutes, and keep mixing it. You can tell the rice is toasted when all the grain results very hot at touch. Block the cook with half a glass of white wine (which will conveniently evaporates very fast) and then add enough ladles of broth to cover all the grains (3). Depending from the rice it should cook in 15-20 minutes at medium heat, just make sure it never drains. around 5 minutes before the rice is ready, add the sausages and the mushrooms to the mix, along with half a ladle of water from the mushrooms (4). Remember to always use boiling water not to block the cook, and to adjust the consistence of the rice (creamy or thick) before the mantecatura. I personally like the rice thick, not “all’onda” like the milanese one. But still, you still want to feel all the grains separated in your mouth. Take the pan out of the heat to “mantecate” the rice with the grana padano and the butter. Just add the grana and the butter to the pot, mix gently until everything is melt, then cover with a lid for 3-5 minutes. The rice has to rest, and the tastes to blend. Then serve, with a pinch of parcley and a grind of fresh pepper on top. 1. Cook the mushrooms with a clove of garlic. 2. Then the sausage with the scallot. 3. Then the rice with the mushrooms broth.